Our two zucchini plants have produced a steady crop over summer. There are a number of my favourite zucchini recipes on this blog which you can find under Vegetables in the index, but I’m always looking for new ideas. The original recipe for these fritters (from Delicious magazine) uses Halloumi cheese, which is what I used and they were delicious. But some of my readers, living in South America for example, can’t buy Halloumi and even Feta is not easy to find. I reckon pretty much any cheese would work and I look forward to readers’ comments telling me what they used. I would be lost without my Magimix which has a large 0.5cm grating disc that makes quick work of the grating. It didn’t come with the standard attachments – I had to buy it separately – but it’s proved to be invaluable. 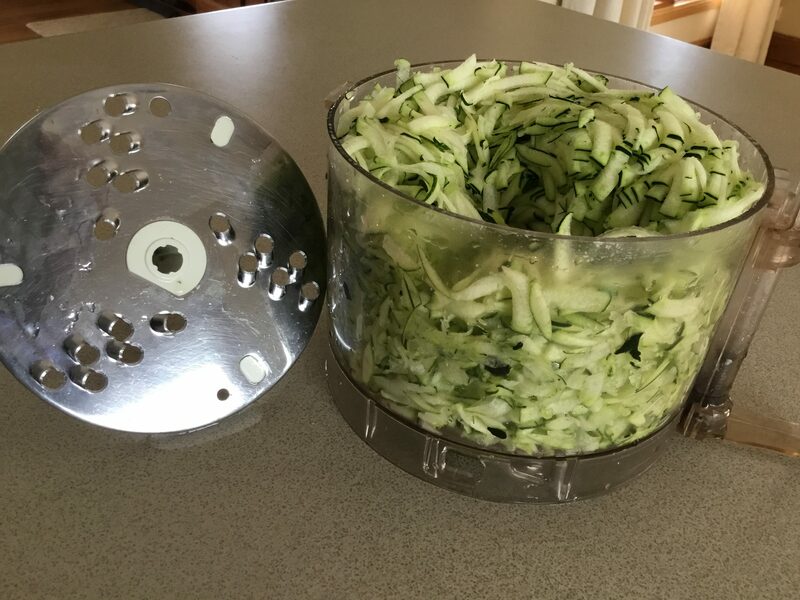 Place zucchini in a colander with the salt, mix it through with your hand then leave to stand in the sink for half an hour. Squeeze out as much of the liquid with your hand. In a large bowl place zucchini, ham, cheese, flours, eggs, dill, chilli flakes, pepper and the 1 Tbs oil and mix thoroughly. Heat a little olive oil in a large frying pan and cook the fritters, 3 or 4 at a time until golden brown on both sides, flattening slightly with the spatula. Drain on paper towels and keep warm while you cook the rest. Add a little more oil for each batch and use about 3 Tbs or so of mixture for each fritter. To make the sauce, place all ingredients in food processor and whiz till smooth. 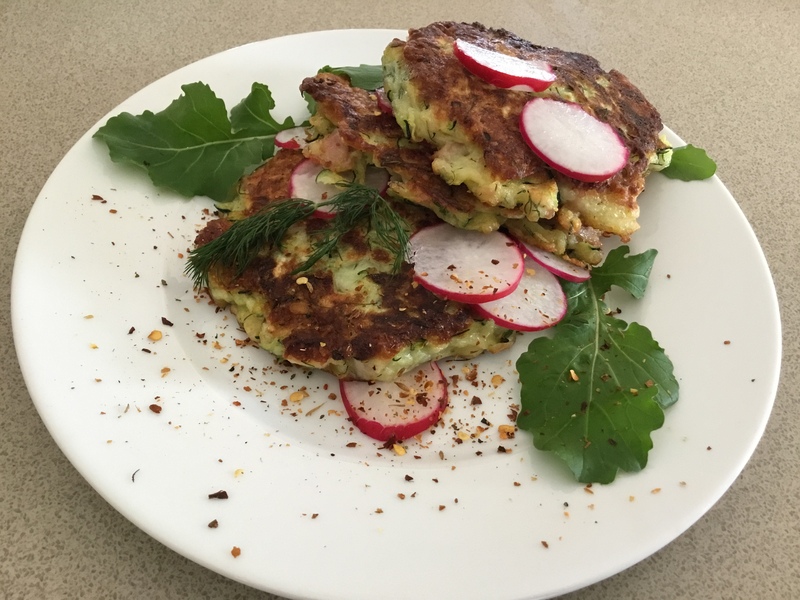 Serve fritters garnished with some salad – I used rocket and radishes but you can use anything you have available. Pass the sauce in a jug. I used one large zucchini which weighed around a kilo. I cut it lengthwise into four and then removed and discarded all the seeds. With smaller zucchini there’s no need to do this. If you don’t have all 4 herbs for the sauce, use more of the ones you have. This entry was posted in Recipes and tagged easy, kids, lunch, quick, summer, vegetables, vegetarian by Linda Peek. Bookmark the permalink. great recipe for a light lunch.